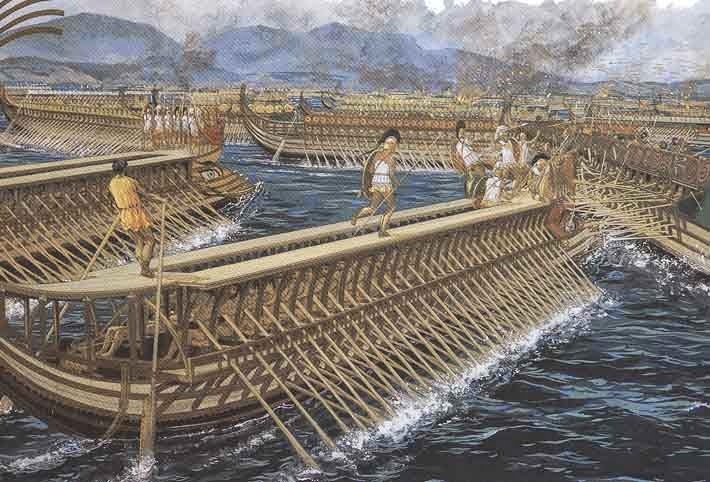 In the Age of the Ram, before ships became fighting platforms, it was the trireme which dominated ancient naval warfare. No other oared ship, before or since could achieve such speed and agility under oar - the ideal characteristics for ramming combat. The ramming attack has, though, the paradox that the attacker has to come into contact with the target and give him a chance to engage in deck fighting. Pure ramming tactics eschew deck fighting. The attacker should, ideally, hit the target and back away before its deck crew can take any action against the ship that just sank it. Deck troops were a necessary evil to those using what Thucydides terms modern tactics. A sea battle which just resembled a land battle on floating platforms was not very edifying. Brute strength could win rather than skill and technical prowess. The raison d'etre of the trireme was manouvreable speed. Sacrificing this to stay locked with another vessel while the deck troops hacked away at each other was a crass folly. But there was a necessity for some combat troops on deck. Deck troops had a special role and must learn how their role meshed with the other activities and priorities of the fighting ship. Everything hinged on keeping the ram in action . Deck troops were there to defend the ship. There were only 10 or so spearmen on each trireme as fighting deck crew. Ten men cannot possibly board and take over an opponent which has 170 oarsmen plus deck crew. With casualties and leaving some men on their own ship this idea leaves us with the suggestion that, say, 6 or 8 marines could fight their way onto an enemy ship and then subdue 200 men. Thus, their job was effective defence in the very special situation of being riders on a ram. They must be effective but not hinder the operation of the trireme. What must they have done and how did they do it ? Epibatai were ranked second on the ship after only the trierarch. Aristotle considered them to control the ship and so these socially and militarily elite members of the crew seemed to have helped the trierarch maintain discipline and morale. Leaving one's oar at a critical stage of the battle was obviously not tolerated. 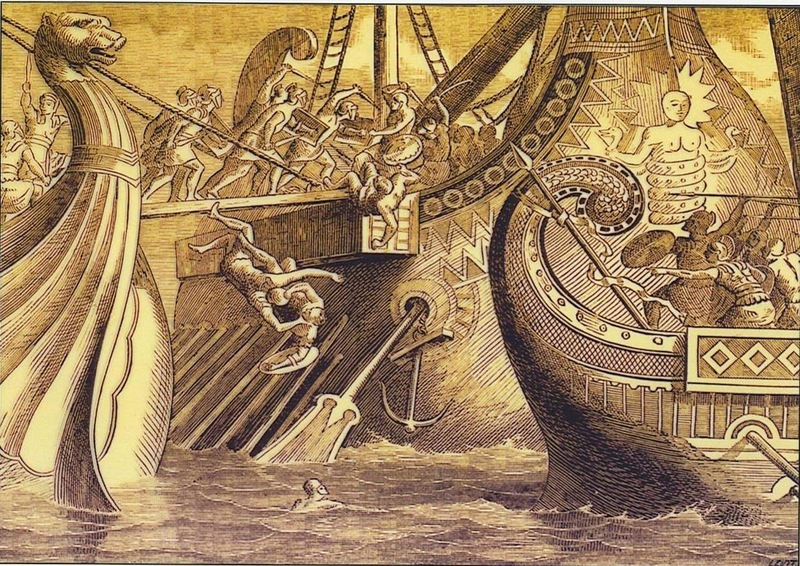 The rowing crew or nautai were usually free men and had some status of their own but that freedom did not extend to endangering the trireme's human engine. We have a hint that the Athenian epibatai were a military elite when we learn from Thucydides that the loss of 120 epibatai in Aetolia in 426bc by Demosthenes was considered a tragic loss of the best and fittest soldiers. The archers aboard Athenian triremes were described as sitting beside the helmsman and trierarch in the stern. The hoplite-armed were to be found on the main deck.The armament of the epibatai may have included specially long spearsfor ship-to-ship fighting and javelins alongside their normal doru and some form of sword.Throwing javelins from a sitting position was the preferred method. Quite a skill. This was to avoid men standing and moving on the deck which could cause the ship to roll a few degrees and hamper the strokes of the oars, especially the thalamites. - the lowest row. On Olympias, the movement of one man could lead to complaints from rowers that they could not row efficiently. Pictures of epibatai standing or running as their ship approaches another to ram it or watching as another attacks them, are misleading. The force of impact could be up to 2G and the crew must have had a procedure to brace for impact. Anyone standing on the deck when two triremes collided would be thrown off their feet, maybe injured and maybe chucked into the drink. The epibatai must have waited for the impact to subside and then moved to the forecastle to deter enemy boarding attempts as the ship backed-off to sail away or maybe ram again. Nice picture shame about the place. If they were already assembled at the forecastle this would depress the ram in the water, if at the stern this would raise the ram. Either of these cases could increase the chances of the ram being lodging in the enemy hull. The logical solution is that the troops remained midships or distributed but not concentrated in the bows. If the ship was itself rammed then the epibatai must get to the point of impact as fast as possible and repel any enemy boarding attempt and support or assist their own crew's attempts to get off the enemy ram a.s.a.p.. The elite deck troops were fit and agile. They were used to getting around the shifting deck in quick order, and they had to be. Their equipment included the large aspis which was about 7kg in weight, the doru a 2.3m spear and a sword about 60cm in the blade. They probably had helmets - In the Persia Wars possibly in Corinthian style and thereafter a more open-faced style. The intense nature of deck fighting might make a simpler, more open helmet more liely so that the soldier could see and hear better. Armour may or may not have been worn. If the epibatai equated with hoplites then they probably did have armour. This would be a linen or bronze cuirass. Greaves were available too. The whole kit could add 25 kilos to the soldier's weight. Some authors have written that if an hoplite equipped warrior fell into the sea he was doomed to drown. This is not true. 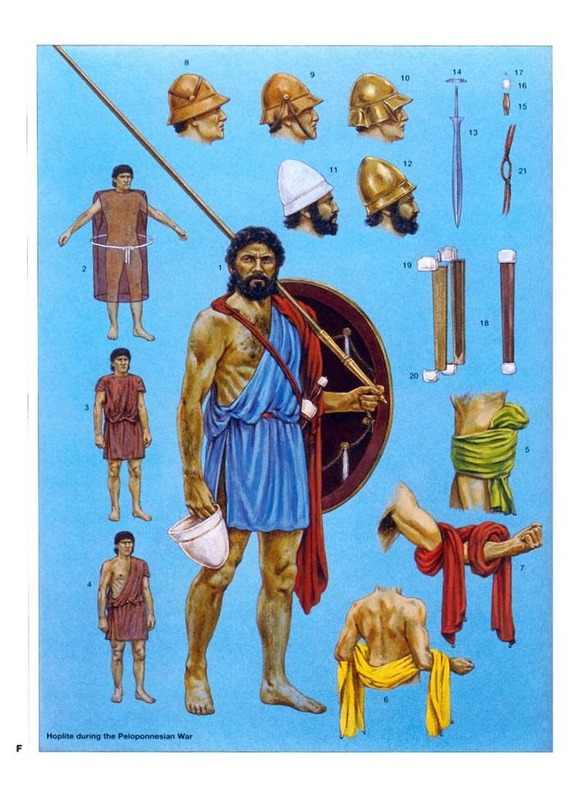 It is possible to swim in a mail shirt so if the man throws his shield and helmet away he should stand a chance to swim a short distance or hang onto a nearby oar. The equipment was, however, quite a burden in a hot climate and the cross-gripped shield in particular could not be shed easily and meant the man's hands were not available to grab a hold if he needed. 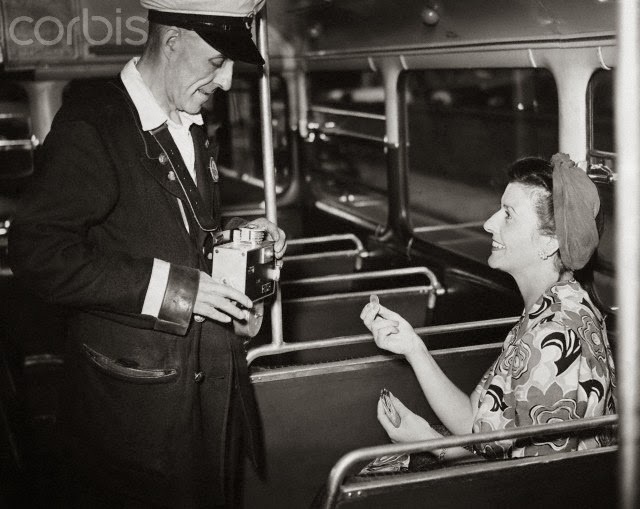 When I was a boy I was impressed by bus conductors who could effortlessly stand issuing tickets as the floor of the bus bucked and rolled beneath them using both hands to take money and reel out tikcets. . Epibatai needed to develop such skills. The requirement for a deck soldier thus equipped to get around amongst the ropes and gaps on a moving deck support Thucydides description of the dead of Demosthenes' force as particularly fit and able. 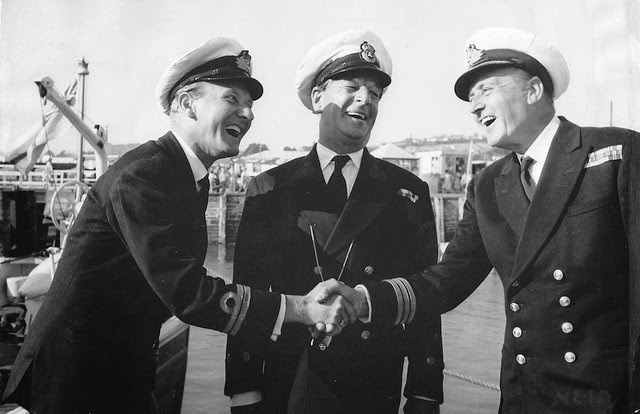 Any attempt to go on the offensive and try to board an enemy vessel would be a daunting prospect even for these men. To make an opposed crossing onto the enemy deck would be very dangerous. Most of the anecdotes we have for deck fighters end badly. There are no accounts of swashbuckling heroes clearing enemy decks. 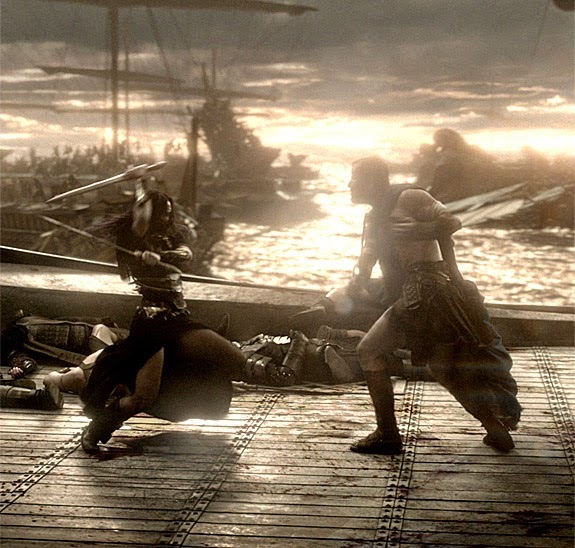 There are examples of warriors coming to grief, such as Brasidas - felled as he tries an amphibious landing at Pylos and Ariamnes at Salamis who is pitched into the sea on the end of Athenian spears as he attempts a boarding. 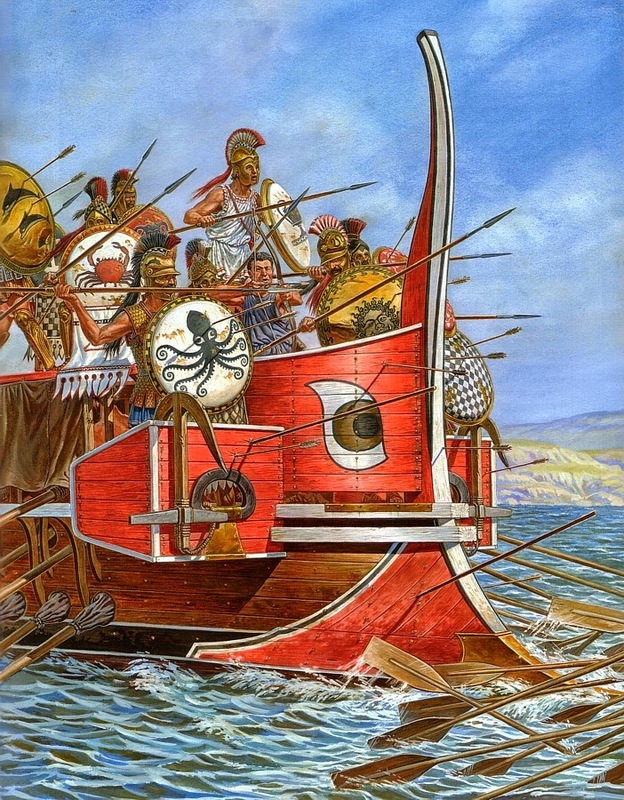 Successful boarding is achieved by the Samothracians at Salamis who, though suffering a deadly ramming attack , revenged themselves by taking over their tormentor whose ram became lodged fast. We must remember here that the Samothracians would have had c. 50 deck troops against the Aeginetians' 15 and the battlefield was now relatively motionless with access to the other ship assured - an exception proving our rule, maybe. Talking of Brasidas.. the deck soldiers' other function was as amphibious marines. They had to disembark and fight on occasion. Another versatility which infantry did not have to match. At the battle of Kyzikos the Athenians disembarked troops to attack the town and to attack the beached Peloponnesians. They may also have re-embarked some troops and set them into the fight on the other side of the bay. The chance of normal hoplite infantry re-engaging on the same day were small indeed.